Chess-player and physician; born at Lublin, Russian Poland, Sept. 7, 1842; died in London June 20, 1888; son of a Jewish convert to Christianity who was a clergyman at Lublin. He was educated at the gymnasium of Breslau and at the university of that city, whence he graduated in medicine in 1866. As a member of the medical corps of the German army he saw service in 1866, and again in the Franco-Prussian war of 1870-71. Zukertort, who was destined to be one of the mosteminent exponents of the game, learned to play chess in Breslau when he was about nineteen. Entering a tournament in that city, and receiving the odds of the queen, he lost every game, whereupon he took up the study of Bilguer's "Handbuch," with the result that in 1862 he won games from Anderssen at the odds of a knight. Within a very few years he became one of the strongest players in Germany; and in 1871 he defeated Anderssen in a set match. 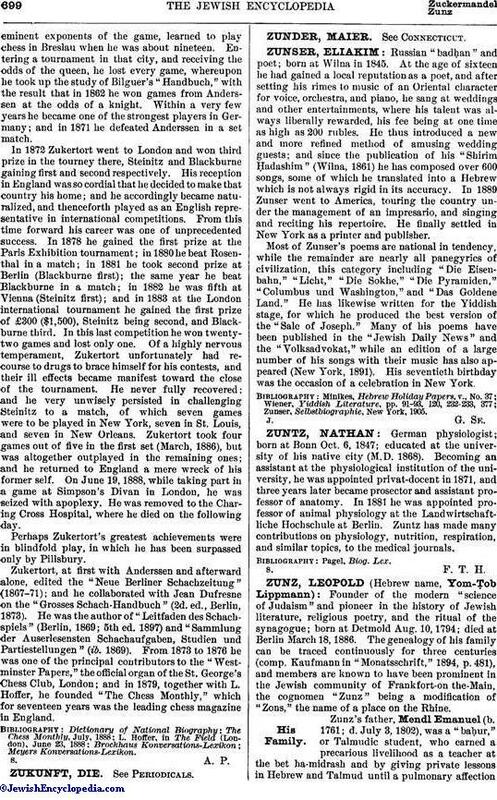 In 1872 Zukertort went to London and won third prize in the tourney there, Steinitz and Blackburne gaining first and second respectively. His reception in England was so cordial that he decided to make that country his home; and he accordingly became naturalized, and thenceforth played as an English representative in international competitions. From this time forward his career was one of unprecedented success. In 1878 he gained the first prize at the Paris Exhibition tournament; in 1880 he beat Rosenthal in a match; in 1881 he took second prize at Berlin (Blackburne first); the same year he beat Blackburne in a match; in 1882 he was fifth at Vienna (Steinitz first); and in 1883 at the London international tournament he gained the first prize of £300 ($1,500), Steinitz being second, and Blackburne third. In this last competition he won twenty-two games and lost only one. Of a highly nervous temperament, Zukertort unfortunately had recourse to drugs to brace himself for his contests, and their ill effects became manifest toward the close of the tournament. He never fully recovered; and he very unwisely persisted in challenging Steinitz to a match, of which seven games were to be played in New York, seven in St. Louis, and seven in New Orleans. Zukertort took four games out of five in the first set (March, 1886), but was altogether outplayed in the remaining ones; and he returned to England a mere wreck of his former self. On June 19, 1888, while taking part in a game at Simpson's Divan in London, he was seized with apoplexy. He was removed to the Charing Cross Hospital, where he died on the following day. Perhaps Zukertort's greatest achievements were in blindfold play, in which he has been surpassed only by Pillsbury. Zukertort, at first with Anderssen and afterward alone, edited the "Neue Berliner Schachzeitung" (1867-71); and he collaborated with Jean Dufresne on the "Grosses Schach-Handbuch" (2d. ed., Berlin, 1873). He was the author of "Leitfaden des Schachspiels" (Berlin, 1869; 5th ed. 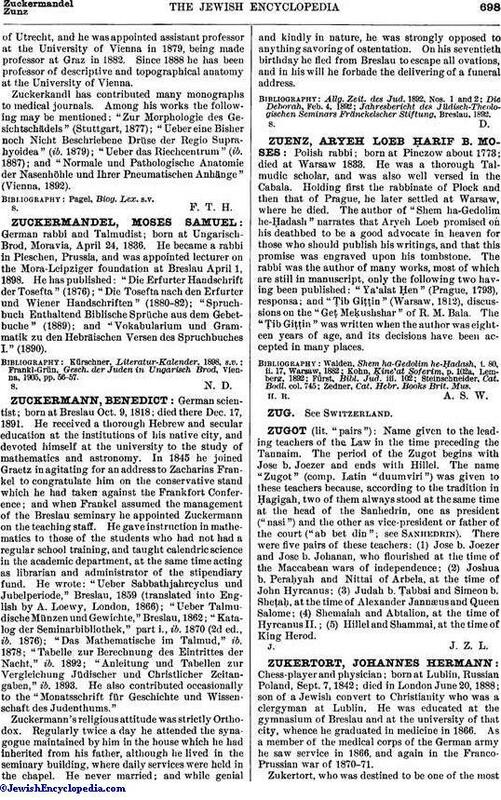 1897) and "Sammlung der Auserlesensten Schachaufgaben, Studien und Partiestellungen" (ib. 1869). From 1873 to 1876 he was one of the principal contributors to the "Westminster Papers," the official organ of the St. George's Chess Club, London; and in 1879, together with L. Hoffer, he founded "The Chess Monthly," which for seventeen years was the leading chess magazine in England.